Joey’s mom tagged me recently for this meme of five things. I am delighted to procrastinate on contemplating my mortality (or that of those around me) and happily share this with you instead! Wallet chock full of plastic cards for every conceivable purpose —many of which have nothing to do with actually paying directly for anything —and a picture of my son and my husband. Cell phone with far more pictures and videos of Nik (and his daddy) than telephone numbers for people I ever talk to; it’s my portable memory book. Eyeglass cleaning kit for the reading glasses I never seem to remember to take with me anywhere. Empty business card case. Though I don’t have an actual job which requires business cards, I made some up for myself to make it easier to exchange information at conferences and workshops. I gave the last one out at Tuesday’s meeting to a visiting parent who was looking for some local support. Pens. Lots and lots of pens. I seem to attract them for some strange reason; never mind that I rarely have anything to actually write on in my bag! My entire CD collection which ranges from Annie Lennox to Enya to ZZ Top with a very healthy dollop of Chopin, Tchaikovsky, Mozart, Sondheim, Frank Loesser, Gershwin, Glen Miller, and a whole host of every genre of music (except gangsta rap). One might call my musical tastes eclectic —or schizophrenic. My small and equally eclectic collection of antique books. If I had the space and funds it would be a much, much larger collection —preferably housed in a large English manor somewhere, in a library with floor to ceiling shelves and lots of quiet nooks for reading or napping. My most prized specimen was an original copy of Elizabeth Barrett Browning’s Sonnets from the Portuguese (1850) which I was foolish enough to take that to college with me; some schnook stole it. The works range from Twain to Dostoevsky, Hegel, Kant, Spinoza, and E.B. White. Among my favorites are leather-bound, gilt-edged works by Thackeray, collections of essays by Ralph Waldo Emerson published the year before his death in 1882, an English translation of the Koran published in 1880, and John Greenleaf Whittier’s Among the Hills (1869); many of these once belonged to my Nana Cook whom I adored. Also included in this treasure trove is a small representation of lighter fare such as Louisa May Alcott’s Under the Lilacs (1887), A Spinner in the Sun (1906), Minkie (1907), and Persis Putnam’s Treasure (1908)—all of which once belonged to my paternal grandmother, Momo. Mostly suitable fare for a young woman brought up in a modest Quaker home just after the turn of the Twentieth Century (she was born in 1897). I remember reading some of these books as a young girl when I would visit my grandparents at their summer home in Cape May, NJ. But my favorite —the book which I still take down periodically and ever so gently turn its pages —is Longfellow’s Song of Hiawatha published by Bobbs-Merrill in 1906 with exquisite illustrations by Harrison Fisher. This, too, belonged to my Momo. Most of these books are not worth a lot except to me; they are a scant yet tangible connection to my family history. Most, if not all, of these books belonged to cousins or aunts and uncles of my grandparents’ or great-grandparents’ generations and were lovingly gifted between them with inscriptions in spidery copperplate. I cannot explain it but I feel a strong connection to these remnants of lives long passed; as if these books might speak to me and tell me more about the people on my family tree. Framed photographs I took of the ocean crashing onto the rocks as the tide came in on the beach in Davenport, CA. I used to love driving down Route One with the sunroof open, music blaring, the wind whipping my (then) long hair into dark tangles dampened with salt to arrive at this quiet little cove. I’d wander along the water’s edge finding shells and stones as I waited for the perfect inspiration —photo or otherwise. It is this same beach where Niksdad and I often stopped to stretch our legs while out for a ride on his Harley. Sometimes we would make it a destination for a romantic picnic or a special way to celebrate Easter morning at sunrise. I’ve always felt a strong connection to the ocean; I don’t think I could live anywhere that I wouldn’t at least be able to drive to it within a couple of hours. A small cedar box which contains the ashes of my beloved cat, Tasha. She chose me when I was in college in Louisiana. This tiny little gray and black and white tiger striped kitten climbed up my pant leg and nestled into my arms; she stole my heart immediately and irrevocably. We grew up together, Tasha and I. She slept under the covers with me, shared Kalamata olives with me, and was my backup alarm clock when I hit the snooze one time too many and her breakfast was late. She moved with me from Baton Rouge to Boston to South Jersey, Philadelphia, and New York City. She was an intrepid cross-country traveler as my parents drove me from Delaware to California in an RV when I moved to San Jose in 1998. Settling in California, Tasha and I rounded out our seventeen years together until she grew too ill, too old and frail to survive another move. Tasha always had impeccable instincts about men —Niksdad is the only one she ever took to. I often wonder if she held on long enough to make sure I was going to be okay; she died in my arms in the middle of the night just weeks before my wedding in 2001. I miss her every day. Rocks I collected on a trip to Nova Scotia one year —another exciting RV excursion with my parents. We visited the Bay of Fundy—one of two places in the world to experience the phenomenon of tidal bore — and walked out into the actual bay while the tide was out. The specimens we collected were exquisite! The rocks are small talismans I keep on my desk to remind me of the forces of nature, the strength of family, and that time can smooth out many hard edges. Visit the British Isles; I’d love to rent a small country cottage for a summer and really soak up the countryside. Sing at La Scala or The Metropolitan Opera in NYC. I came close in a six-degrees kind of way; I once studied voice with McHenry Boatwright who once sang at the Met. I also studied with Luba Tchereseky who was, allegedly, blacklisted at the Met and so, subsequently, were her students. I did, however, once sing in a recital here. Sing professionally with a band performing music of the big band/swing era. Hey, Nik’s first home-PT experiences were often to the music of Glenn Miller or Tommy Dorsey! Learn to draw and paint. Being the best mom I can possibly be to Nikolas. Learning to take better care of myself. Planning my summer household reclamation project (aka figuring out how to dig our way out from under all the junk we seem to have accumulated but not found a place for)! Learning as much as I can about Augmentative Communication so I can help Nik with his communication efforts. Trying to find the time and energy to write more regularly. Marla and Maizie, Jenn, Delilah, and Angela. Seems the Easter flu is going around. I knew Nik’s raging fever couldn’t be from a simple ear infection. Now he’s coughing and has a runny nose…and has shared his bounty with me, too. Sigh…won’t be many festivities in our house tomorrow. Oh well. 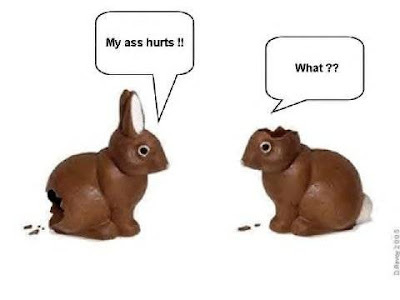 Chocolate bunnies are a bonus! When the dawn begins to crack. It’s all part of my autumn almanac. So I sweep them in my sack. Yes, yes, yes, it’s my autumn almanac. Yesterday, the sun rose brightly on a crisp, dew-sparkled morning. The call of early geese carried on the wind. Leaves swirled from the large maple in the neighbors’ yard, drifting down to grace our late summer garden with a scattering of golden yellow, flecked with brown and red. The cats lazed on the window sills in the dappled morning light as our household awakened lazily without the aid of alarm clocks or a crying child in the dawn hour. Seven o’clock. Blissful awakening. It felt like a good morning for a family adventure. So off we went in the picture perfect autumn weather to the Fall Festival held by the same folks that hosted the Peach Festival in August. It was busy in a small town sort of way —just enough to entertain but not too much to overwhelm. There were children’s mazes made of hay bales, a giant maze cut through the corn fields, pumpkin painting (which we skipped as Nik isn’t quite into that yet), a petting zoo, hayrides and pick-your-own-apples and pumpkins, as well as corn and soybean “sandboxes” and fresh pressed apple cider. Nik exhausted himself in the fresh air and sunshine. His favorite things were the sandboxes —total sensory delight, and the animals. Nik made fast friends with Paddy, a five week old calf. It was a mutual affection, apparently. It was so wonderful for us to watch Nik really engage with Paddy; we actually had to keep him from climbing on top of the poor calf! The change we saw from the last time we were here was phenomenal! Nik was so much more aware of his surroundings and of the other children. And he even managed to bring home about a quarter cup of beans; imagine “The Princess and the Pea” —in his shoes! They somehow got up under his pant leg and down between his orthotics and his foot. OUCH. Poor kid. No wonder he didn’t want to walk or stand after he got out of the beans. And here we thought he was just tired. But that wasn’t as bad as another kid who I watched end up with a diaper full of beans! And, reminiscent of the peach ice cream encounter in August, Nik managed to surprise us by tasting and actually enjoying fresh pressed, mulled apple cider. Ordinarily, Nik won’t drink anything but water. If he has a single sip of juice or milk he pushes the cup away and makes a face as if I poisoned him. My drama child! Not only did he not push the cup away, Nik actually kept pulling my hand back to give him more. Needless to day, there’s a half gallon container of the stuff in my fridge right now. 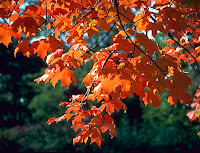 I love the autumn; it always feels like a fresh start to me. And after all we’ve been through recently, we’re certainly ready to put it behind us and move on. It’s felt like a long week for some reason. Could be the long holiday weekend in which Nik exhibited the balance of a Zen master in his escape from the crib. Or the frequent interrupted nights of sleep which have been randomly sprinkled throughout the week. Or, perhaps, it’s just the emotions I have roiling inside my head and heart lately. I have been deeply affected by both the utter joys of some of my friends’ blog posts, and sunk low by the pain, worry, or despair in still others. I have been feeling things very acutely lately. I guess it takes a toll after a while. Since we’ve been on a roll lately, we decided to chance it. We planned our outing with military precision. Pump? Check. Syringe and tube? Check. Meds? Check. Sippy cup? Check. Mesh feeders? Check. Toys? Check. Forward march! And off we went…to Applebee’s for an early dinner. And it was a pleasant experience! OK, except for the part where I smashed the tip of my finger under the seat cushion of my broken chair. No blood; I’m fine (sniff, sniff…rolls eyes dolefully). Nik was amazing throughout the entire dinner! He was alert and fully engaged in the environment and with us. That is not something I have ever been able to say about previous dining experiences. I did brush Nik and do joint compressions before we left the house; maybe the sensory input helped him regulate himself better? Or, just maybe, Nik has made another developmental spurt. 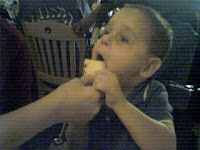 Nik’s favorite thing, the thing which held his attention throughout most of the meal was a pineapple wedge. 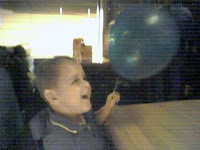 Between the pineapple and the balloon the waitress brought for Nik to play with, we never had to pull out a toy. Not once! 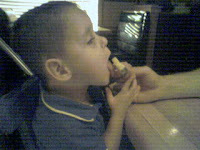 Nik slurped and licked and laughed and played at taking turns feeding Mommy and Daddy. He tugged and batted at his balloon —laughing hysterically each time it bopped him in the face. Niksdad and I laughed right along with him. It was the first time I can remember in a very long time that we simply laughed together and took such unadulterated joy in a moment that included our son’s active participation. Frequently we will watch Nik and laugh at his antics, but this was different. This was a shared moment —a relationship. And while I am bragging, I must report that Nik was very clear in his communications tonight. When I offered him something in the mesh feeder (I brought three with us!) that he didn’t care for he simply pushed it away and reached for the one he wanted —or for the pineapple wedge. Poor wedge, suffered nearly the same fate as our friend the peach slice! And Nik colored! Ok, I don’t mean in a coloring book with pretty pictures kind of way. I mean in the manner of a child who has just begin to learn about holding a crayon; chubby sticky fingers clamped awkwardly around the too-thin waxy stick, Nik jabbed at the page and actually moved his hand back an forth a time or two. (The picture on the right is cropped bit of the kid’s menu. If you open the pic in a new window, you can see the oragne crayon marks!) He even showed his hand preference —finally! Turns out my son is a lefty! Yeah, we got some odd stares from people around us. Not so much disdainful looks. More like curiosity about the little boy with the tube running under his shirt. The boy who was so obviously having a grand time with his parents. Wondering, perhaps, what is “wrong” with him? Wondering perhaps what is wrong with his mother that she keeps talking to him like he’s done advanced calculus on the back of his napkin? Who knows? Tonight we couldn’t have cared less what the rest of the world thought. Tonight, we were “just another family” and it felt grand. Got this from a friend recently and just had to share it. You may want to turn up the volume so you can understand the words. It’s hilarious! I can’t get this video to load on blogger so click HERE to watch…Anita Renfroe’s William Tell “Momisms.” She is one funny lady!